Davidson Optronics D614-101 Penta Prism/ Optical Square- 0.3 arc second accuracy. 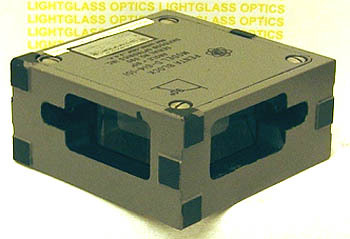 The Davidson Optronics D614-101 Penta Prism is also known as an Optical Square. The Quartz Penta Prism takes the incoming collimated beam ( which may be out of its normal plane by as much as 5 degrees) and re-orients it accurately by 90 degrees. Davidson guarantees an accuracy of +/- 2 arc seconds on these Optical Squares.. It has lapped pads to precisely mount it or can be equipped with a threaded post to mount in a spindle. All of the D-614's use quartz prisms. In excellent condition and in its factory mahogany box.